Various research programs are being pursued in the Berghuis lab. However, all programs share a common theme in that they use structural biological approaches to examine interactions between enzymes and small molecules (e.g. substrates, cofactors, inhibitors). The principal technique used for these studies is X-ray crystallography, complemented with small-angle X-ray scattering, electron microscopy, nuclear magnetic resonance spectroscopy, enzymology and computational chemistry tools. Furthermore, for many of these programs, efforts are ongoing to exploit the three-dimensional structural information for drug development using structure-based drug design approaches. Below two programs are highlighted. Over the past few decades there has been a dramatic rise in antibiotic resistance, and the situation has now culminated in bacteria that are effectively resistant to all clinically used antibiotics. The research is aimed at dissecting the structural basis for clinical resistance against various antibiotics. Specifically resistance mechanisms for ribosome targeting antibiotics are examined. Many of these antibiotics have lost their potency due to bacterial enzymes that either covalently modify or cleave the drugs. For example, we have determined the detailed mechanism by which aminoglycoside kinases confer resistance to drugs such as gentamicin and kanamycin, and we are currently exploiting this knowledge towards the development of next-generation antibiotics and adjuvants. Fungal infections are a rising concern in the health care sector since pathogenic fungi have become an important cause of mortality for individuals with diminished immune systems. The concern for fungal infections is amplified by the fact that there are a very limited number of antimycotic drugs available and resistance against most commonly used antifungal agents has been observed. To assist in the drug discovery process for novel antimycotic agents, we are pursuing structural studies of fungal enzymes that are involved in the synthesis of essential metabolites that are specific to fungi. These synthetic pathways are absent in mammals, and as such pose an excellent target for the development of antimicrobial drugs. For example, we have determined the structure of the fungal enzyme homoserine dehydrogenase in complex with a drug lead that is able to clear systemic candidiasis in a mouse model. Fong DH, Berghuis AM Structural basis of APH(3')-IIIa-mediated resistance to N1-substituted aminoglycoside antibiotics. (2009) Antimicrob Agents Chemother. 53: 3049-3055. Mirza IA, Yachnin BJ, Wang S, Grosse S, Bergeron H, Imura A, Iwaki H, Hasegawa Y, Lau PC, Berghuis AM. Crystal structures of cyclohexanone monooxygenase reveal complex domain movements and a sliding cofactor. (2009) Am Chem Soc. 131: 8848-8854. Korczynska M, Mukhtar TA, Wright GD, Berghuis AM Structural basis for streptogramin B resistance in Staphylococcus aureus by virginiamycin B lyase. (2007) Proc Natl Acad Sci U S A. 104:10388-10393. 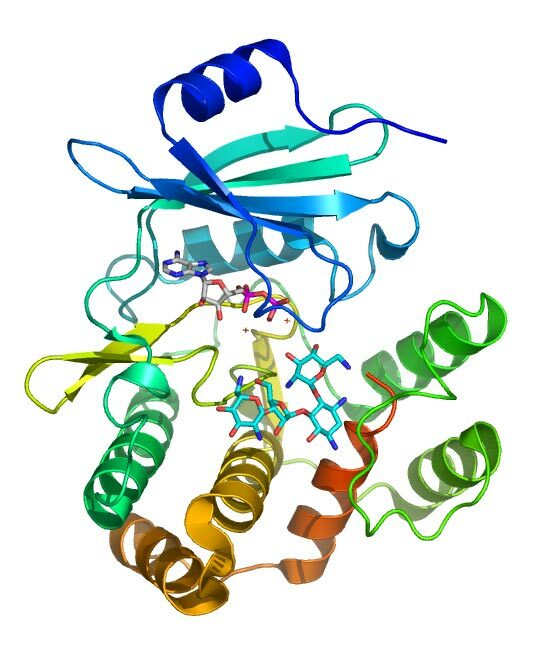 Mirza IA, Nazi I, Korczynska M, Wright GD, Berghuis AM (2005) Crystal Structure of Homoserine Transacetylase from Haemophilus influenzae Reveals a New Family of alpha/beta-Hydrolases. Biochem. J. 44:15768-15773. Jacques SL, Mirza IA, Ejim L, Koteva K, Hughes DW, Green K, Kinach R, Honek JF, Lai HK, Berghuis AM, Wright GD (2003) Enzyme-assisted suicide: molecular basis for the antifungal activity of 5-hydroxy-4-oxonorvaline by potent inhibition of homoserine dehydrogenase. Chem Biol 10:989-995. Burk DL, Berghuis AM (2002) Protein kinase inhibitors and antibiotic resistance. Pharmacol. Ther. 93:283-292. Fong DH, Berghuis AM (2002) Substrate promiscuity of an aminoglycoside antibiotic resistance enzyme via target mimicry. EMBO J. 15:2323-2331.